-Azain Ahmed (USCT) A Madhubani painting workshop was conducted in the University campus. It was a three day event held on 31 August, 1 and 2 September respectively. The workshop was organized by the Lalitya, the Fine Arts Club in collaboration with a NGO named Brain Kothi. The NGO is committed towards the revival of folk arts and their replenishment. There was a healthy gathering of students in the workshop. Dr Deepshika Aggarwal, the faculty in charge of the club was present to oversee the workshop and was indispensable in her efforts in organizing and executing this whole event. 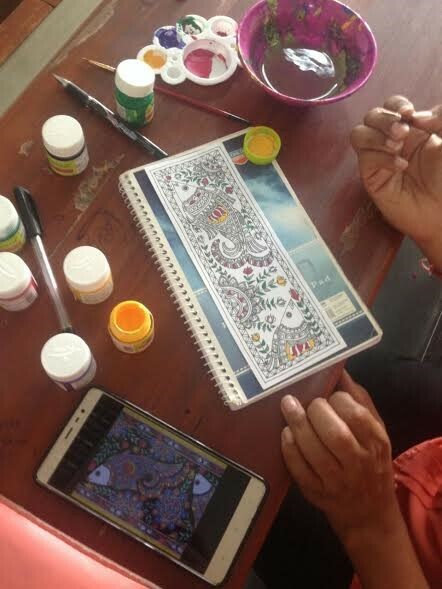 The instructor for the workshop was Ms. Pratibha and she patiently taught all the eager participants the basics of the Madhubani painting in the span of three days. She is a member of the NGO. Although this art form is very intricate and takes a lot of time to learn, Ms. Pratibha made sure that everyone learnt a bit about this art form. The participants also made bookmarks for the Teachers Day celebration using this art form. This was the first time that such a gesture was being made for the teachers. The workshop was a great learning experience for the students of the university. About the Madhubani Art form: Madhubani painting is practiced in the Mithila state of Nepal and in the Bihar state of India. Painting is done with fingers, twigs, brushes, nib-pens, and matchsticks, using natural dyes and pigments, and is characterized by eye-catching geometrical patterns. There is ritual content for particular occasions, such as birth or marriage, and festivals, such as Holi, Surya Shashti, Kali Puja, Upanayanam, Durga Puja. The Mithila region, from which the name Mithila art is derived, is believed to have been the kingdom of King Janak in present-day Janakpur in Nepal.